DIY: Early companies into IoT had to build everything themselves – devices, gateways, cloud platform and application – because there was no-one else to buy these parts from. This took a lot of time and money, and the resulting solution was unlikely to be interoperable with anything else because the 1001 design choices that were made along the way are unlikely to be the same as another company’s. The result is that the company and their customers become locked in a silo, unable to take advantage of all the advances going on in the rest of the world. If your products are “phoning home” to someone else then that company is in control of them, not you. 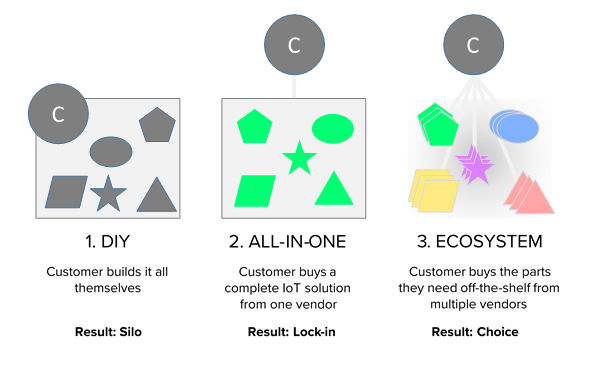 The long-term benefit of IoT is almost always about the ongoing service relationship rather than the up-front product sale, so you have just handed-over the keys to your future business to your all-in-one vendor. No one vendor can be good at everything - not even the likes of Amazon and Google. As time goes by, this all-in-one vendor will increasingly struggle to compete on all fronts against everyone, and fall behind. All-in-one solutions are perhaps reminiscent of AOL or Compuserve before the arrival of the Web. You don’t buy your “Internet” or your “Web” from just one company - and likewise you won’t buy your “IoT” from just one company. Ecosystem: …which brings us to the end-game. As more and more vendors arrive on the IoT scene, it becomes increasingly possible for companies deploying an IoT solution to find all the pieces that they need to make that solution already available “off-the-shelf” – i.e. ready made, either as a product they can buy, or a SaaS they can subscribe to, or even as Open Source. Sometimes call “COTS” (Commercial Off-The-Shelf), this is increasingly the normal way to acquire the large pieces of a solution – the devices, the gateways, the communications services, the cloud platforms and application platforms. And it’s also becoming a common way to acquire even the smaller pieces they are made of, such as communications modules and software stacks. At DevicePilot we are seeing an increasing number of our customers doing exactly this, and perhaps that shouldn’t be a surprise, because that’s exactly how one builds a Web app these days: Take all the bits off-the-shelf, already pre-scaled and high-quality, integrate them together easily and spend your precious time doing what only you how – your USP, your proposition. The massive advantage of Ecosystems is that they provide everyone with scale and choice. Vendors have more customers for their parts, and buyers have a greater choice of each part. Choice and scale both in turn drive quality, because choice drives competition, and because scale allows amortising of investment against large volumes. This is what drives standards to emerge – it’s suddenly in everyone’s interest for the pieces to fit together easily. Five year prediction for the IoT market? In a fast-paced market like IoT it’s worth thinking a little way ahead because your architectural decisions today will have echoes far into the future of your business. I’ll make the bold prediction that most of today’s 300+ all-in-one solutions will ultimately fail, or at least fail to thrive. Those that succeed will do so by proactively opening-up their solutions to open standards (indeed there are early signs of some of the better ones already doing this), enabling them to retire from the “race against everyone” and focus their efforts on one core part of their offering to ensure that it remains best-in-class. Clearly the IoT ecosystem has yet to emerge fully – there isn’t yet universal agreement on what all the pieces are, and even what they are called, and there are still some gaps between them, and some areas where integration is harder than it should be. But as a direction of travel, the ecosystem is clearly the way forwards. We’ve seen many cases where companies build ecosystems around themselves - Apple’s “App Store” is a classic example. And likewise in IoT we’ll see the larger players increasingly building ecosystems around themselves. However in many cases their centrality to “their” ecosystem is partly an illusion. The big picture is that what they are really doing is helping to create one huge IoT ecosystem - a web of relationships and value creation with no single company at its centre. So what does any of this have to do with lock-in? We’ve seen that an increasingly-strong analogy can be drawn between Web development and IoT development. Driven by similar economic considerations, customers are increasingly looking to create their connected propositions entirely from “off-the-shelf” parts – or as much as possible. Whilst there is still sometimes lack of clarity about exactly what those parts are, and there are still some gaps between them, the long-term benefits to both customers and vendors are so compelling that’s it’s probably the right “direction of travel” to plan for. And in this world, vendor choice is key. If one of the off-the-shelf parts fails to perform (and it will) then it must be reasonably easy to plumb-in an alternative in its place. Fear of lock-in by customers will drive vendors increasingly to work to reassure their customers that they are not locked-in, keeping the market reasonably open. How many devices have you deployed? Where are they? Who’s got them? What software are they running? Are they working properly? Are you customers happy? And at scale, those questions are what matters. At scale, you’ll have sorted-out your proposition, but it’s these operational questions that make the difference between happy and unhappy customers, between profit and loss, success and failure. A manual approach to Operations works in trials (in fact, it’s a great way to learn) - but it completely fails as you start to scale. As you deploy more and more devices, you can’t just throw more and more people at the problem - you need a new piece which can gather all the details and give you the big picture, and help you monitor and manage your devices. You need DevicePilot. Click here to talk to David our Commercial Director to see how we can increase the profitability of every device in your IoT estate by increasing customer satisfaction and speed-to-market whilst decreasing your operations and development costs. As a Computer Scientist, serial innovator and veteran entrepreneur who has worked in Silicon Valley and the UK and started five companies, Pilgrim Beart has seen several ecosystems come and go. You can share his further thoughts on ecosystem development in his 2016 TED-X talk here.